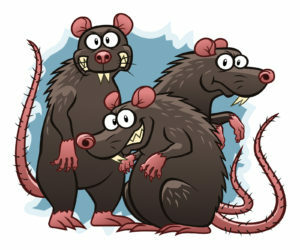 Rat Control: Understand What Rat You Have. Rats need protein to maintain breeding condition. They get this easily when living in an urban environment but in colonies away from human populations they eat primarily seeds and grain. The breeding season in rural environments is controlled by temperature and the onset of agricultural activity. Human activity in urban areas has helped the invasive rats ignore these limitations. Rats can live comfortably in our warm homes and as we have become a society that throws away vast quantities of food, finding enough to eat is not a problem. Left in bins or not disposed of correctly, this food becomes a feast for rats. Compost heaps and bird feeders are two other food sources enjoyed by urban rats. Black rats grow to between 16 and 24cm in length, including a tail which is longer than the head and body combined. They can weigh between 150 and 200 grams, although some individuals can weigh over 300 grams. Overall, they are slightly smaller than Brown rats. Despite being called Black rats, these rodents are often brown or grey in colour. Being excellent climbers they are able to clamber up ropes, brick walls and other rough surfaces. They nest higher than their cousins, often preferring wall cavities and roof spaces. This has given them their other common name: Roof rat. They are good swimmers and very agile. Like many rodents, they can easily gnaw through wood. Black rats are communal animals, often existing in groups of 20 to 60 individuals. Commonly seen in urban environments, they are also found in undisturbed areas around the coast and forests. In more rural areas, Black rats are nocturnal but in an urban setting it is not uncommon to see them during the daytime. Often twice the size of a Black rat, an adult male Brown rat can grow to between 40 and 50 cm, although the latter would be an exceptionally large specimen. Unlike the Black rat the tail is shorter than the combined head and body length. Males can weigh up to 500 grams, although the average for a male is 350 grams and 300 grams for a female. As their name would suggest, Brown rats are normally brown but they can also be grey. Brown rats have been domesticated and kept as pets for many years, which has led to many colour variations. Some of the most common colours for pet rats are black (although they are still Brown rats), white, hooded, cinnamon, mink but there are many others. Tailless varieties, rats with red or black eyes, and even hairless strains are now available. These varieties are available in Australia and if they escape and join a wild colony identification could become more complicated.